Curcumin influences key hormones, supports major body organs, and regulates inflammatory signaling all in ways that help correct or prevent metabolic problems. Curcumin helps lower inappropriately high levels of leptin (reducing leptin resistance) while boosting the all-important levels of the adiponectin (which lowers insulin resistance). Curcumin helps activate the fat-burning gene signal PPAR gamma, which also helps to make more new, metabolically-fit fat cells. Curcuminoid nutrients (curcumin, demethoxycurcumin, bisdemethoxy-curcumin) are usually poorly absorbed when taken by mouth. Proprietary Phytosome technology solves this problem. In Curcumin Phytosome Featuring Meriva, each curcuminoid molecule is individually complexed with molecules of the vital cell membrane nutrient phosphatidyl-choline (PC). 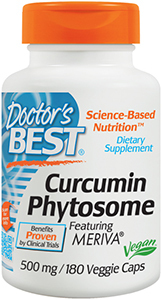 By facilitating entry of the curcuminoids into human cells and tissues, PC gives this product superior bioactivity over non-phytosome curcumin supplements. Take 2 capsules daily, preferably with meals. For better joint, eye, circulatory and prostate support, take up to 4 capsules daily, or more, as recommended by a nutritionally informed physician. Curcumin directly reduces major inflammatory events from occurring inside white adipose tissue (tumor necrosis factor alpha, interleukin-6, and monocyte chemotactic protein-1). When these inflammatory signals are excessively activated in white adipose tissue they keep sending “911” messages to immune cells around your body to come to the white adipose tissue and join in the inflammatory party (like immune cells causing the swelling of a sprained ankle—in this case, sprained fat). By lowering such inflammation, the source of overweight-induced disease is stopped. 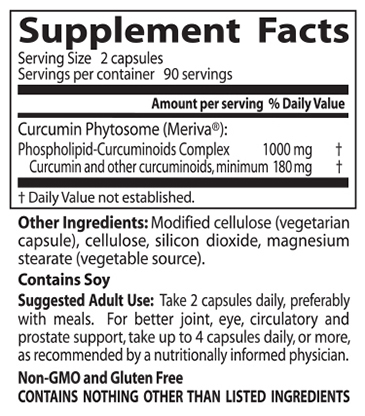 Curcumin acts directly on liver cells to help prevent them from becoming fatty. And it works directly on pancreatic beta cells to help them produce insulin normally. By helping the liver and the pancreas, curcumin is taking stress off the two most important organs whose function declines before the onset of type 2 diabetes. Curcumin helps to lower triglycerides and dangerous small particle LDL cholesterol. Curcumin lowers the core inflammatory gene signal, NF-kappaB, resulting in a beneficial domino effect throughout the body. One benefit of this domino effect is a direct reduction in the risk of cancer from overweight-induced inflammation. Eur Rev Med Pharmacol Sci. 2015 Nov;19(21):4195-202. Potential role of bioavailable curcumin in weight loss and omental adipose tissue decrease: preliminary data of a randomized, controlled trial in overweight people with metabolic syndrome. Preliminary study. Di Pierro F1, Bressan A, Ranaldi D, Rapacioli G, Giacomelli L, Bertuccioli A. This randomized, controlled study aims to evaluate the tolerability and the efficacy of curcumin in overweight subjects affected from metabolic syndrome, with a focus on impaired glucose intolerance and android-type fat accumulation. Forty-four subjects, selected among those who after 30 days of diet and intervention lifestyle have shown a weight loss < 2%, have been treated for further 30 days either with curcumin complexed with phosphatidylserine in phytosome form or with pure phosphatidylserine. Outcomes concerning anthropometric measurements and body composition were analyzed at enrollment and after 30 and 60 days. Curcumin administration increased weight loss from 1.88 to 4.91%, enhanced percentage reduction of body fat (from 0.70 to 8.43%), increased waistline reduction (from 2.36 to 4.14%), improved hip circumference reduction from 0.74 to 2.51% and enhanced reduction of BMI (from 2.10 to 6.43%) (p < 0.01 for all comparisons). Phosphatidylserine did not show any statistical significant effect. Tolerability was very good for both treatments, and no drop-out was reported. Although preliminary, our findings suggest that a bioavailable form of curcumin is well-tolerated and can positively influence weight management in overweight people.